Claus Richard Johnson was born near Gottenberg, Sweden February 6, 1867 and immigrated to the United States in May 1887, settling in Crompton, R. I. 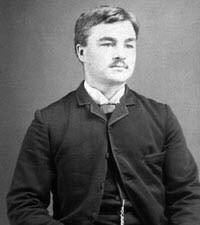 In 1893 he moved to Providence and married Anna Johnson. They had one daughter, Florence Claudia Victoria, and one son, Adolph Frederick. Claus Richard and his brother John Adolph Johnson founded Johnson Brothers Painting and Decorating, a firm which became the largest painting business of its time in the state of Rhode Island. They employed 45 men and had a reputation for the high quality of their workmanship. Their clients included some of the wealthiest and most influential people of Providence. He was an active member of Gloria Dei Lutheran Church in Providence and served as church treasurer for many years. He died May 1, 1916 at age 49 after a 10 day illness, although he had been in ill health for three years. His brother, John Adolph, died less than five months later at age 43.